We were really in the mood to get out of the heat in Mesa. So we searched for a hike that had the baisc criteria of having water deep enough to swim in. We picked the narrows because it is fairly close and we had been to Gisela before so we knew the area. We loaded up our packs, hopped in the car and headed north. As we entered the Fort McDowell Indian Reservation, we could see thunderstorms gathering in the direction we were heading. As we approached Gisela the storm broke loose, drenching rain poured down on the road and lightning began flashing in every imaginable direction. We briefly considered haeding home but the thought of a refreshing dip kept us going. We got to the trailhead which was located almost directly at the cloud break. We waited 15 minutes in the car for the last remaining drops of rain to fall and then headed down the trail. From the parking lot, go through the gate and follow the dirt road. Keep heading toward your left because to the right is someone's private property. Don't worry too much, it is well marked which way to go. 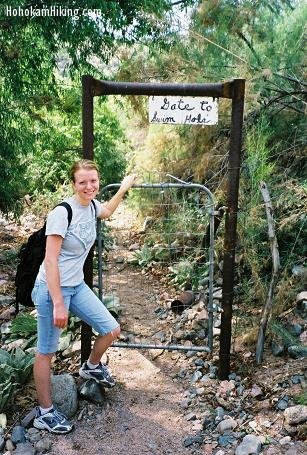 You'll see the Tonto Narrows stream shortly after you go through another gate and set foot on the trail. The plants in this area have a very distinct smell, so if you think it stinks you probably are heading the right direction. 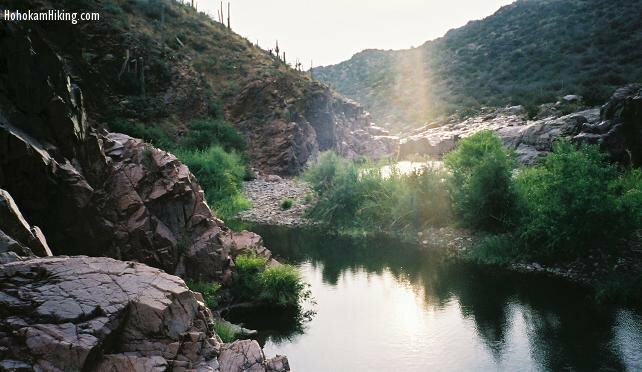 Shortly after you will reach a gate that leads to the Tonto Narrows with an old sign that simply reads "Gate to Swim Hole." This is a great photo oppurtunity. Head through the gate (it will close automatically behind you) and keep on heading down the trail. 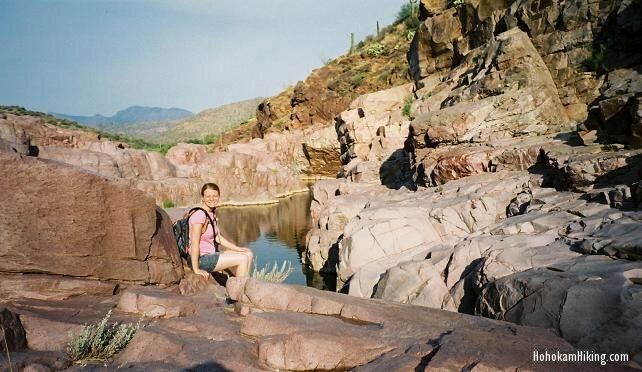 You will soon reach the rocky beach of the Tonto Narrows. There are two large swim holes before you reach the actual narrows. There is sand that makes for excellent campsites, just clear the "cow-pies" first. We camped by the upper pool and this was the view from the rocks above our campsite. We probably would have slept great here, except that the storm caused such a spike in humidity that we were sticky from sweat the entire night. We never once got in our sleeping bags and still were miserably hot. My recommendation to avoid this is to go in the Spring or Fall or at least not during a thunderstorm. 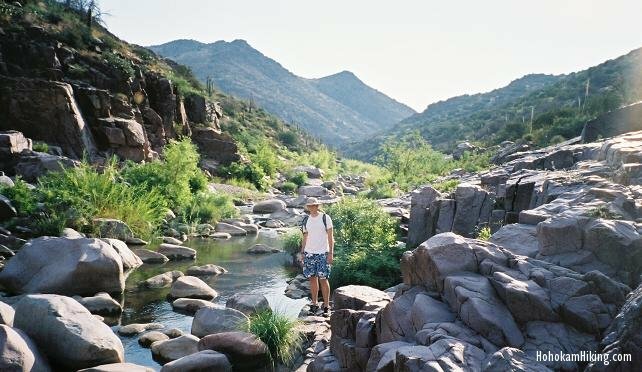 The next attraction up the stream is the Tonto Narrows. Here the water has carved through the canyon making cliffs on both sides. People cliff jump here, just be aware of the under water boulders and watch those who have done it before to see where it is safe to jump. The stream pushes through here pretty fast when the water level is high so keep your feet in front of you to avoid banging knees on the rocks. Past the Narrows, the stream gets wider and meanders through large boulders. It gets greener and greener and in my opinion more beautiful. You can hike above the strem on the cliffs or if you're in the mood to get your feet wet, you can rock hop pretty far up the stream. We only went a little ways, but the stream is rumored to head up the hill 20 miles or more. 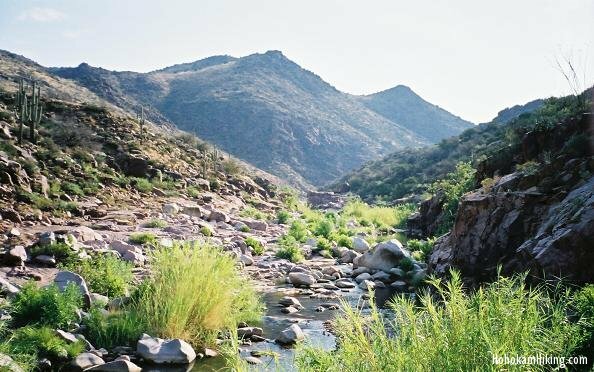 There are beautiful areas to hike, camp, or wade up here so be sure to not spend all your time down below where the water is less clear. Upstream the Tonto Narrows turns into a decent desert oasis. It's green and the water gets considerably clearer. In the stream, we saw some large fish--we're not sure what type they were. We also saw toads, fireflys, and unfortunatly lots of ants. You get used to the distinct smell of the foliage and the water is refreshing. 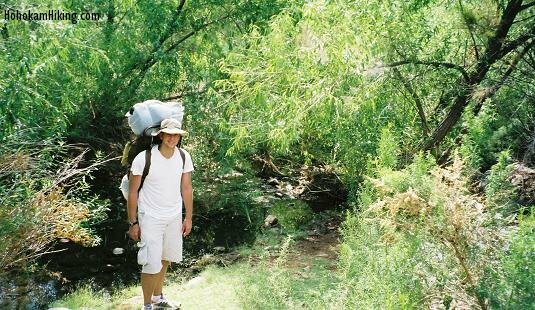 The hike is short and sweet so if you want a quick get-away, Tonto Narrows is a great place to head.